The original goals of the new Farmington Aquatic Center were to include aquatic environments for recreation, competition and instruction. However, to improve the financial performance of the project, the decision was made to emphasize the recreational aspects of the pool to attract more users. As a result, attendance has increased from 100 visitors per day to 500 per day with both pools open. The leisure pool provides large open areas for exercise classes and unstructured play, as well as a beach area for young families that features zero-entry depth for easy access. 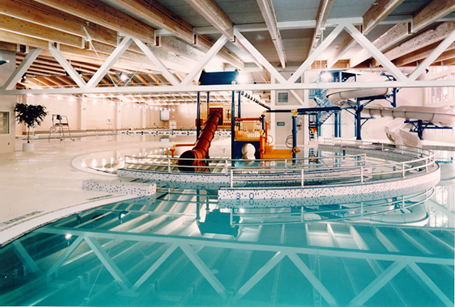 The combination of pools presents opportunities for water activities for swimmers of all ages. 50-meter-by-25-yard Olympic pool accommodates competitive swimming, lessons and open-lap swimming. Leisure pool features a water slide, elaborate play structure and a fountain with more than 100 sprays.